With the summer rapidly coming to a close and cold fronts beginning to pass through weekly, excellent fall fishing is on the forefront in the Charleston area. Fall inshore redfish are at their best as they visibly feed heavily in preparation for the cooler temps to come while speckled trout really turn on with clear cooler water becoming the norm. Bull redfish congregate at most sandbars and surf areas and the annual mullet run begins along the beaches and inlets where tarpon and other large predators voraciously attack huge pods of sea-run mullet. 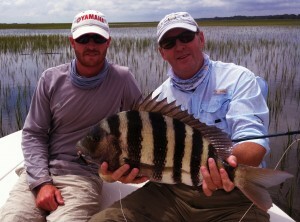 The best part of the year in the lowcountry is swiftly approaching where the fishing will be stellar. Lighter Breeze Charters feature inshore fly and light tackle fishing trips with Captain Hunter Allen. The inshore waters around Charleston and surrounding Lowcountry areas are home to a myriad of species. Whether you are a fly tournament angler or a novice wanting to bend the rod, Capt. Hunter Allen takes pride in providing calm, informative and entertaining trips in search of plentiful Redfish, Speckled Trout, Flounder, Tarpon, or other assorted game fish.